That’s right everyone, we are past the half-way mark of summer so it’s time to get in your registrations for the afterschool program! Our unique program is a complete blast for the kids, and the training & leadership development unmatched! Very hard to believe that so much happens each and every day. For all returning students just drop off your registration forms, and if you are someone new interested just contact us to setup a time for a tour and see what all the excitement is all about. Lastly, please remember that we do have limited space in this program and will most likely reach full capacity right away! So, while all returning students have a space, all new people are welcome on a 1st come 1st serve basis. And then once program full, we will add additional people to a wait-list. Have a great end of the summer, and look forward to seeing the kids back on the mats! June test is NEXT week, please get ready for those of you who are strong on your levels! If you are not sure if you or your child is ready to test please speak directly with your (or your child’s) instructor. For kids, parents please connect with Mr. LaFave before or after class or via email at daniel@hwarangdomn.com – and he can provide specific feedback as needed. A Tae Soo Do Black Belt Graduation will be held at 12:30pm on the 18th, after the regular belt test. Come show your support and congratulate Solveig, Ava, Chay, Merik, & Hamdhi for making it through the Tae Soo Do journey! This group has come a long way since they first began the martial art journey years ago, and it is exciting to see how far they have come. Along with the Black Belt presentation the candidates will be putting on a demonstration of some of the many things they have learned through their Tae Soo Do training. The Party will take place immediately after the graduation and will be a pot-luck style gathering so please bring something to share with the rest of the group. Feel free to bring your family and friends for this special event to watch the graduation as well as connect with others from our school celebrating the time that Instructor Sirny first began teaching here in the Twin Cities area 15 years ago. We look forward to a wonderful time together, and THANK YOU so much for your support of our school over the years!!! The staff has been getting ready for the all the details regarding our exciting summer camps!!! This year has six sessions – and each week will be unique in terms of its martial art training, leadership development, and crafts/projects. Along with some weekly archery and playtime too, the summer camps have been completely awesome and we are very much looking forward to the sessions this year. There is still space available, but we know the registrations start coming fast this time a year – and remember – we do have LIMITED capacity for our camp sessions. If you needed more information just visit http://tlksummercamp.com/ for the full scoop on the sessions & details! 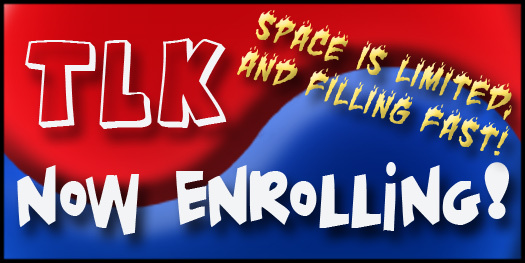 2 for 1 ADULT & TEEN Enrollment Special! Have you been hiding away in your home all winter? Are you looking for a great way to re-energize yourself and thaw out from the deep freeze? 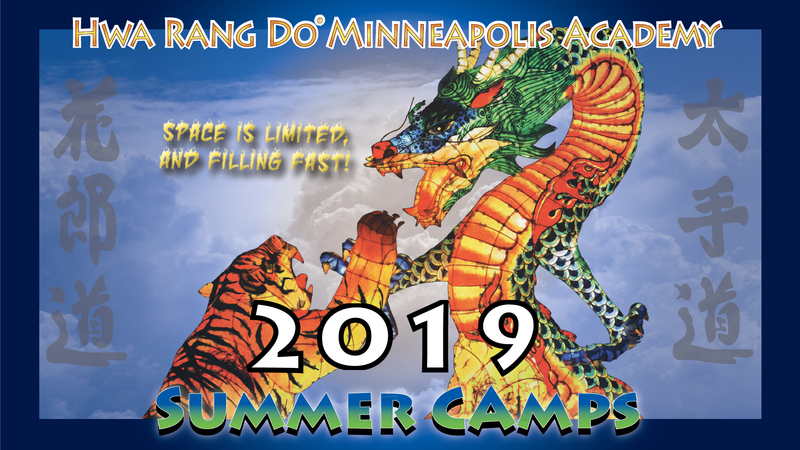 Spring is almost here and during the month of April the Hwa Rang Do Minneapolis Academy will be running a 2 for 1 special on ALL NEW Adult & Teen enrollments. 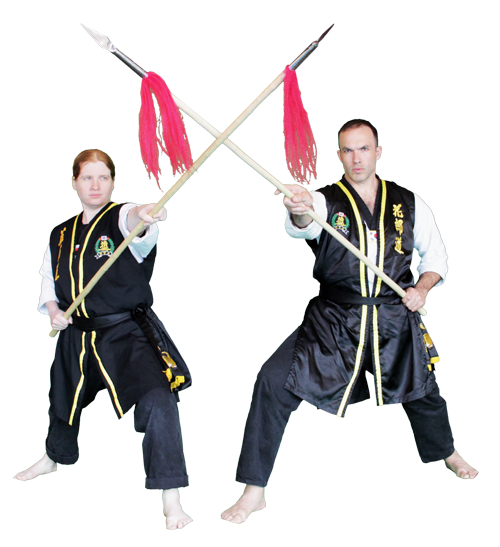 Activate yourself through our complete martial arts program! While our Children classes are close to capacity, we have some new openings in the Adult & Teen Levels. No excuses folks – It’s time to JUMP on in with this rare special tuition opportunity – offer expires April 30th! Get in Shape: Escape the monotony of repetitive exercise and learn something new everyday as you get in the best shape of your life. Please enjoy your time over the next couple weeks with your families. There is so much going on in all of our lives all year round, and even lots to do over the holidays coming and going everywhere. However, I hope that we all can soak in our time with those close to us. Time will fly by that’s for sure, so let’s build some moments and connections that are valuable. As a reminder there will be no classes starting tomorrow (Saturday) through Sunday January 3rd. However, the dojang will be open for some staff projects & administration – plus there is open mat time for anyone who is looking to get in some workouts and sweat a little. So, for the next 2 weeks, the Mondays, Tuesdays, & Wednesdays open hours will be from Noon to 8pm, and then all closed up on the other days of the weeks. Monday January 4th everything will be all back to normal full schedule! I know most of you got things all set to go for spring, however, if you haven’t already please take care of renewing spring registration. We need to confirm our spaces, and of course want to ensure that all existing people keep their spaces in the program as we are still close to our full capacity #s. This can be taken care of with Bryce, and if you need to email with him, just use bryce@hwarangdomn.com as a contact point or swing into the dojang during hours mentioned above. Thank you all once again for a wonderful year! I feel very fortunate that we have such a great community of people participating in Hwa Rang Do, and it is exciting seeing so much vibrant strength and energy from all of you. Enjoy the break from the outside world, and soak in the internal! Balance back and forth for peace and harmony. *Please get your test forms in! 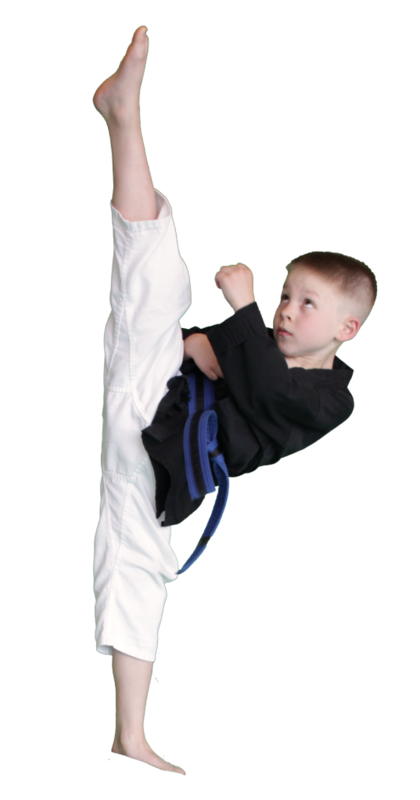 Immediately after the regular promotional examination ceremony there will be a special TSD Black Belt Graduation and demonstration for Nick, Stephanie, Logan, and Owen. They have been working very hard the past few years, and now ready to become true Hwarang and move onto their sashes! Pot-Luck Dinner will take place immediately after the demonstration. Please bring a dish to share, and check out the sign-up sheets on the counter at either 1st or 2nd floor for adding your name to the menu selection! Party will go late, but feel free to stay as long as you can. I know there are other events this time of year – so have fun here and there! The Dojang will be open tomorrow morning for all who wish to join as a group for a moment of silence, meditation, and prayer for global peace & harmony. If you are unable to attend here, we hope that you will be able to take a moment of your own – for 11 minutes, on the 11th minute, on the 11th hour, on the 11th day, of the 11th month. This moment, will continue on as an annual HwaRangDo holiday, as we recognize the anniversary of the strategic summit that developed our vision statement, as well as to shine some light and peace into our chaotic and unstable times. As we calm ourselves, many possibilities open! 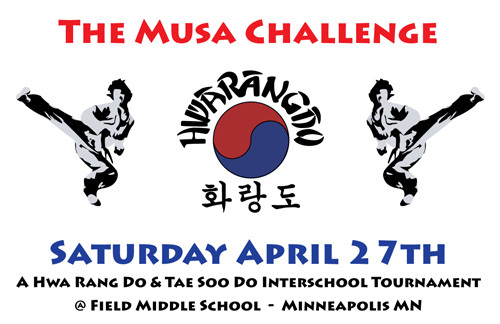 Musa Challenge – Annual Tournament Coming Soon! That’s right, one of the most exciting days of action is fast approaching – our annual interschool tournament! 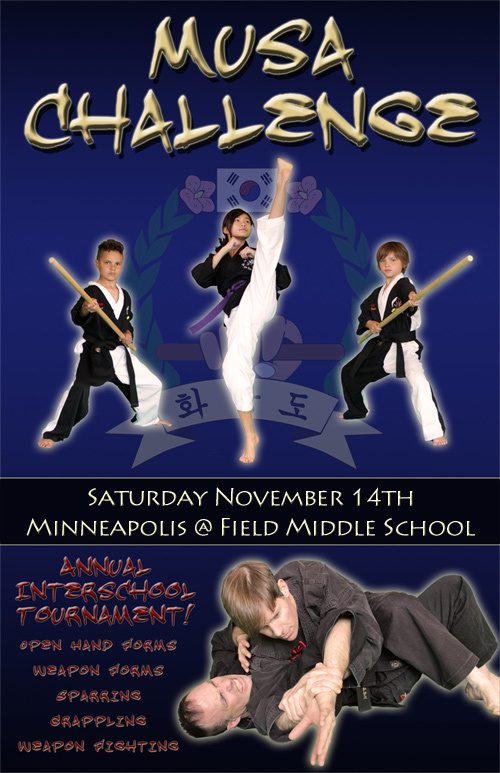 There are events for ALL students of ALL ages and ALL Belt Levels. We will be practicing hard the next few weeks to get ready for the show. Plan & register now! CLICK HERE FOR THE INFO! Register For Afterschool Program NOW!!! Summer’s end is fast approaching, so that means school time is right here! This also means that if you are looking at afterschool time options for the kids, you better hurry if you want to get in on the amazing action offered here with us!!! 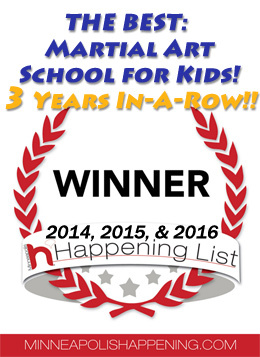 That’s right, not only do we do incredible martial art training everyday, but we also make the most of the afterschool time frame with insightful and productive lessons. While MPLS kids and so many other places only play games, we have fun with training + leadership development, life lessons, community service, and some crafts & science based activities. The kids can also get in some homework time too, plus a decent mix of freetime, so the afternoon is filled with quality here at our facility. We have also restructured our facility over the summer to allow for additional enrollments (reached capacity last year), so if you want to catch one of the last remaining spots, please make sure to come on in for a tour ASAP and get registered! Even though we have added space & staff, the additional spaces will get filled up and our wait list will return again. We have been planning away over here and now have all of the Summer Camp Information squared away and all lined up! There will definitely be another action packed set of weeks here. As most of you know our camps are modeled after our afterschool program, and the emphasis of Martial Art Training + Leadership Development + FUN is our way of having a good time. Each week of camp is unique in terms of the “Theme” as well as the martial art training offered! We also have some pretty cool field trips lined up this year too, so we hope that the Kids will be ready for all of the action! Go Online www.TLKsummercamp.com For All of The Details!!! Current Students, New Students, and General Public are ALL Welcome! Remember, camp sizes are limited to 45 kids per session though, so make sure to get in your registrations ASAP to reserve your space! Cold days are here, but dojang still open for people to warm up & sweat! I know that some schools are closing up tomorrow, and some schools still haven’t decided – HOWEVER, we will be open for normal hours and programming. It will obviously be cold out so make sure to bundle up if you do decide to head out, and if you stay home we understand as well. Choose what you want, and we happy to be here! -TLK Afterschool is open for regular hours 2-6pm. For all of the TLK families, if you want to drop off your child to participate in some afternoon training and some other fun and games you are welcome. For the non-Wednesday kids, you are also welcome to come as well – ALL TLK kids welcome as long as you are currently enrolled in TLK program. If participating please make sure to arrive by 2:30pm as we will be getting into the projects and training then. 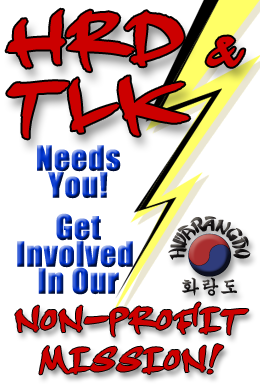 -For other dojang kids/families looking for something to do, if you want to jump into this “open” TLK Afterschool day you are also welcome. There will be $25 “drop-in” fee to participate. 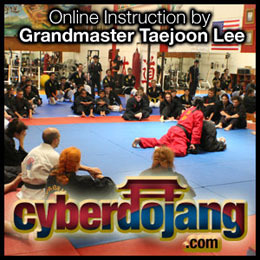 There will be a seminar style martial art class plus some fun activities/projects/games. Again time frame 2-6pm. If choose to participate please show up by 2:30pm too (and yes have uniforms). -Regular classes are on Regular schedule for the rest of the night. Ok, if we don’t see you here – STAY WARM!